When Rodney Erickson accepted the unprecedented sanctions that were forced by the NCAA last year, it’s well known that Joel Myers criticized what he said was an unauthorized signing of the consent decree. But behind the scenes, one other trustee also railed against the agreement to fellow board members, and another questioned whether the university president lied. Sent from an iPad the morning after Mark Emmert announced the penalties, Lubert complained that Erickson misrepresented the death penalty threat to the board and said Penn State should challenge Ray on his claims. The e-mail was among 86 pages of records released by Gov. Tom Corbett’s office last month in response to a Right-to-Know Law request. His office also withheld 56 other records. The state Office of Open Records is reviewing the documents to determine if they can be released. Instead, Erickson claimed that the NCAA threatened to suspend Penn State’s football team for four years unless the university accepted the consent decree. 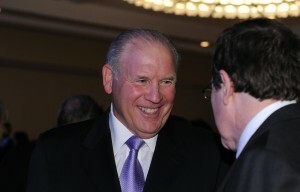 Later that day, former state Secretary of Education Ron Tomalis, who co-chaired the group that oversaw Freeh’s investigation, also questioned Erickson’s credibility. “How consistent is this with what was on the call, since I had to drop off,” Tomalis wrote to Jennifer Branstetter, a trustee and member of Governor Tom Corbett’s staff, as well as trustee Mark Dambly, in an e-mail. But Myers was the first trustee to call for an end to the consent decree in a memo to board members on night that the sanctions were announced. Citing the cost, the NCAA’s unusual negotiating tactics and an obligation to university students, Myers, whose term will expire next year, said the agreement was a mistake and called on board members to reject its implementation. “lf the NCAA is not willing to act in a fair and reasoned way, then we need to consider securing the best legal and skilled negotiating talent to stand up for those who count on us to be their voices – the students and alumni, the community and the state,” he wrote. On August 10, 2012, he released a different version of his complaints to the public. Nobody’s outrage lasted very long. During a public board conference call on August 12, 2012, after the sanctions were announced, neither Tomalis nor Lubert challenged the consent decree or Erickson’s description of the negotiations. Lubert and Myers threw their support behind Erickson, and all three said the board needs to move on. It’s unclear why Lubert changed his mind. He didn’t respond to an e-mail seeking why he stopped challenging Erickson’s description of the negotiations. At the beginning of this year, Lubert and Myers were both appointed to the board’s powerful executive committee. I don’t know which is worse: to be so oblivious as to blindly accept the decrees of tyranny, or to recognize them but ignore the obligation to resist. Fkn pussies – all of em. Either stand up for what’s right or GTFO! This is why we need legislature to step and abolish the Executive Cmte. And get rid of the Business and Industry trustees that are running this university. Good stuff Ryan. I have read any doc I can so appreciates you helping get them released. If frustrating, (but we need to hang in there), that we can’t vote them out much quicker. I am sending this E-mail (from Lubert and Myers) to Attorney General Kane with a request that she investigate whether the NCAA illegally appropriated $60 million from Penn State. Are any of you aware that Ed Ray has clarified the remarks he made to ESPN? options were to accept the sanctions or a death penalty of four years. Is that correct? My sense is we’re now inventing stories out of word choices. If I were Rod, or if I were advising Rod, I would have said, “We faced a very real risk of the death penalty. It is on the table, and I think this is the right outcome for us because if we got the death penalty, it would be terrible.” Because you know what? Before we voted, it was on the table. And it wasn’t there as a threat — it was a real risk that we as a group, the executive committee and the Division I board, would have said, “Yes, we want that in the bundle.” That’s why I’ve told everyone who’s asked … it wouldn’t have been just the death penalty. It would have been the death penalty plus presumably all of the corrective actions and some elements of the other punitive actions that would have been a bundle. The first thing we voted on was would it include the death penalty or not, and it wasn’t unanimously no. There were people who voted for the death penalty. It was a real risk. If I had to do parsing words, I’d say Rod is absolutely correct. He was looking at a world in which there was a very real risk that they would get the death penalty that wasn’t decided until we took our vote. But nobody said, “If you don’t do X, we’re going to do Y.” That conversation never happened. That’s very interesting. So did Erickson misrepresent the NCAA’s offer to board members, or did board members misunderstand his account of the negotiations? Lubert was very adamant that the choice was between the consent decree and the death penalty. The BOT power structure is filled with lawyers, bankers, CEO’s, and financial dealmakers. They are also big egos who like to influence others. Why on earth would these captains of industry hand sole unilateral decision-making to a lifelong academic and bureaucratic bumbler like Rod? They allowed a guy like Rod to sit down eye-to-eye with the powerful NCAA to negotiate a $60 Million deal? I find it hard to believe Rod was the Lone Ranger here. I am sure he had very specific marching orders from the BOT. The BOT knows Rod is weak; that’s why they picked him. Good work Ryan. I can’t wait to see more emails, especially the ones the state is holding. President Erickson was quoted today as saying that Penn State accepted that deal because if not, you would have decided to suspend play. Can you confirm that? Ray: I’ve known Rod for a long time. I didn’t hear what he said. I was on a plane flying back to Oregon. But I can tell you categorically, there was never a threat made to anyone about suspension of play if the consent decree was not agreed to. So it wasn’t as though you said, “Take this deal or we’re shutting you down”? Ray: That was never even a point of discussion within either the executive committee or the Division I board. What is Ray trying to clarify? His clarification is double talk to make both sides look good calling it a real risk. Based on his comments above, how was the death penalty a risk? Was the death penalty ever an actual option, yes or no? If yes, in what context? If no, why did Erickson ever mention it to the trustees? Who came up with the consent decree, Erickson or NCAA? Considering they’re discussing the most severe NCAA penalties in 25 years, why was this even a grey area? The NCAA should have provided sanction options in writing for the whole Board to review and then discuss with the NCAA. Not get “lost in translation” because of one person. Somebody is lying, that is the only rational explanation. The only potential penalty that we had some extended discussion around was suspension of play, whether that ought to be part of a basket of punitive and corrective measures. There were people who felt that was appropriate, but the overwhelming position of members of both the executive committee and the Division I board was to not include suspension of play. And therefore we moved quickly to a consideration of the actions you heard about today. And that had unanimous support from both groups. So, suspension of play was on the table as he said in his clarifying remarks. Let’s do a little semantic analysis. Think back to the Cold War or if you aren’t old enough to remember do a little Googling. Erikson certainly is old enough to remember. At that time, it was very common to talk about the threat of nuclear war whenever there was a conflict between the US and Soviet Union. The idiom did not mean that one country or the other had explicitly threatened the use of nuclear weapons, rather what it meant was that any confrontation between the countries could lead to a nuclear war, i.e. nuclear war was a definite risk in any confrontation. The “death penalty” was an option which was discussed before the decent decree was put in front of him. Had he rejected the decree or tried to negotiate a weaker decree, there was the real risk,or threat in the idiomatic usage of the Cold War, that the “death penalty” would have been imposed. I think it is very plausible that this is the meaning of threat that Erikson had in mind. Now right there, that removes the threat of the death penalty, your Cold War analogy is ridiculous. US Presidents and Soviet Premiers were not sitting at a table telling each other what they would do to each other if one did not comply with the other’s wishes. There shouldn’t be anything implied with regards to the sanctions, Erickson should have had his options directly laid out to him. If the death penalty was a possibility, it should have been laid out to bare by the NCAA, not lingering in the background. If Erickson was truly doing his duty to PSU he should have asked, if we do not agree to this consent decree, then what are our other options. Not just agree to it under a veiled threat of the death penalty. Have the NCAA put it directly on the table. And if the NCAA did threaten the death penalty, Erickson’s duty should have been to fight for PSU and threaten legal action against the NCAA if they tried to enforce it. That’s a negotiation. What other school would accept those type of sanctions on the “chance” they could get the death penalty. Either they would get it, or they wouldn’t, this shouldn’t be a point of contention. Either Ray or Erickson are misrepresenting their position. Your discussion depends on suppositions about the discussions that Erickson had with the NCAA. There is nothing inherently wrong with this, provided that you have some model of Erickson’s administrative style which is supported by past observations of that style. However you give no indication of any depth of thought about Erickson’s administrative style and you make assumptions which puts Erickson in the worst possible light. This is likely colored by your transparent dislike for the outcome of the negotiations. Other assumptions would be more favorable to Erickson. At this point, it is unknowable what transpired in those discussions. Did Erickson ask about his options? Don’t know. Was he told that the suspension of play did not have support of the majority of the board? Don’t know. Did he ask what other options had been discussed? Don’t know. Was he told that the only other option discussed was the “death penalty”? Don’t know. Let’s ask ourselves what would have happened if he asked about his options and the answer was the only other thing we considered was the “death penalty”. What interpretation would you expect him to give that answer? Negotiations are not deterministic and a negotiating partner is unlikely to put all of the cards on the table simply because it demanded of them. Further, in the case of the NCAA, the organization could unilaterally impose whatever penalty it wanted to. This gives them the upper hand in the negotiation. Because of the lack of determinism, one must look at the expected costs during negotiations. Sign the decent decree with known costs or try to negotiate a better deal in which the outcomes are more sever sanctions, including the possibility the death penalty, or less sever sanctions. Even if there was a low probability of the death penalty, the costs associated with it would be orders of magnitude greater than the consent decree. Hence the expected cost of that negotiation would likely greatly exceed the know costs of signing the consent decree. I’m sure that I’m not going to change your mind, but the expected cost of trying is rather low for me. This is not a typical business negotiation, the NCAA does not directly monetarily profit from imposing sanctions and should be open and honest with their member schools and “put all their cards on the table”, obviously that wasn’t done here. And you’re right, we don’t know what the options were or if Erickson asked about what they were, but given the impact they have on the entire school and the state of PA shouldn’t Erickson and the Board of Trustees at least ask? From the reactions of some Board Members, they thought consent decree or death penalty. My whole argument is there should be no confusion by the NCAA, Erickson, or the PSU BOT what their options were, there should be transparency from all involved. This type of negotiation should not include any grey area. The mere possibility of Erickson asking about other options should not cause the NCAA to institute the death penalty. And the NCAA cannot just unilaterally impose whatever it wants, that is against its bylaws, although that didn’t matter in this case. It must present its findings to the school in question, give the school (not one person at the school) a chance to provide a response, then decide on an appropriate punishment based on that response. The school then has the option to appeal that punishment if it wishes and it must go through an appeals process. During this whole time, the school and the NCAA can negotiate a punishment they both agree with if both parties decide to do that. Also, this whole process usually takes months, if not years, not a few days. Very much like our congress we need fresh blood in those elected seats. I can only hope more alumni share my sentiment. We didn’t send a loud enough message at the last election in my opinion. The Pennsylvania legislature needs to clean house with the PSU BOT. The fact that this email comes from Jennifer Branstetter makes me highly suspicious. Ms. Branstetter is Gov. Corbett’s non-voting representative on the PSU BOT and a member of his senior staff as Secretary of Planning and Policy. However, her primary background is in Public Relations. She worked for a PR firm prior to joining the governor’s election campaign and then his administration, she was also deputy press secretary in the Ridge Adminstration, so she definitely has experience with spinning stories for PR purposes. And most suspicious, Corbett named her to the PSU BOT 2 days after Paterno was fired on 11/9/11. It seems her role on the BOT was more of helping to manage/manipulate the BOT’s public relations to fit more of what the Governor wanted. Would not surprise me in the least if Ms. Branstetter informed the Governor of this dissent within the BOT and he then put pressure on those trustees to fall in line with the rest of them. Rubber stamp acts by trustees with rubber wills to act properly and decisively. They’re almost as despicable as the wesk-sister Erickson. “Fraudney” to the core. 1. A cook from Cafe 210, Mark, who shot and killed his girlfriend Jan.
2. The guy from Unimart who stabbed the woman named Linda in Bellefonte, I also played a concert for her memorial. 3. Jilly, the Hub lawn shooter. That’s a lot of killers to know for one small town. I wasn’t able to reply through Facebook as you were probably banned, I’m am guessing? Join the shepherds, not the sheep. Stop being herded in the wrong direction.Sign up for news and announcements.